There’s a lot of talk right now about right and wrong. So much disagreement, with so much passion! Like everybody else, I have my own ideas of what’s what. But not-like-everybody-else, my ideas in that regard are mostly kept to myself. I seldom share the specifics. That doesn’t mean I don’t further what I truly believe is right, though. The upcoming Taort forecast answers exactly how to do that. 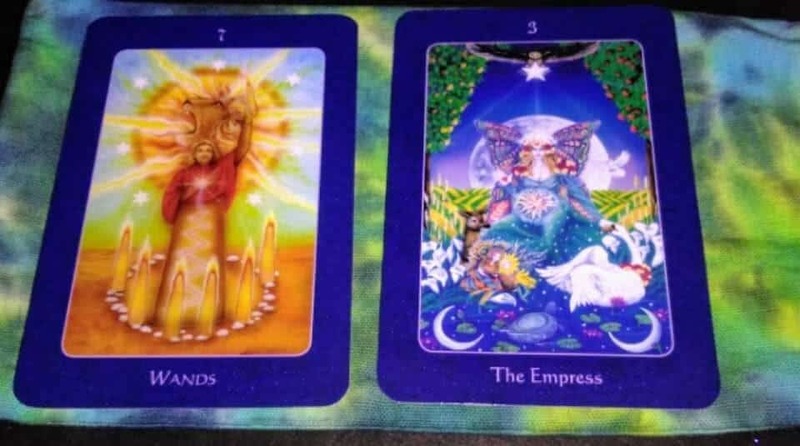 For the weekly outlook, we have the Seven of Wands, with advice coming from The Empress from the lovely Star Tarot Deck. Now, I always think of the Seven of Wands as representing a stand-your-ground sort of vibe. Entrenched in your own vision of what’s right, you fight off any who would seek to topple your own moral authority. But a lot of people misunderstand this card. The Seven of Wands is a very personal type of fight. We’re not talking about controlling what the rest of the world does here. We’re talking about maintaining your dominion over your personal values and morality. The deck author describes this card as representing a conflict between inner values and outer reality, and that’s a wonderfully apt characterization. There is a sense of isolation or mismatch with this card. What you see around you, what’s expected of you and what you feel is right may not match up this week. You may have to put your foot down. But understand this is not a call for global activism. It’s a call to live true to your own values despite whatever forces are rumbling to the contrary. Forcing others to go along with your morals is not only ill-advised but impossible. But living according to your own morals? That’s do-able. So with that in mind, I absolutely love the Empress showing up for advice. She’s not telling us to fight for what we believe is right. She tells us to live it instead! That’s a whole lot more effective. Instead of fighting for what you don’t want, give birth to what you do. If I want to live in a world that’s loving and respectful, guess what? Yelling at those who I don’t consider to be loving and respectful doesn’t really further the cause, you know? It just turns me into what I’m railing against. On the other hand, by practicing and embodying the qualities of love and respect even in situations where it may be challenging, I am actually giving birth to a tiny piece of the world I want to live in. I’m being it. There is a huge amount of dissatisfaction coming from many, many different quarters. Instead of getting upset over what doesn’t resonate for you, channel it into inspiration for what you’d rather give birth to instead. Create what you want, first in your own life where it grows to influence others as well. You’re no less a warrior approaching change from the inside out. Even better, you’ll feel the difference immediately. If you’d like to discuss how to make changes in your own life, give me a holler for a one-on-one.